Long-range expert motor yacht builder Outer Reef® Yachts is proud to announce plans to showcase three Outer Reef Yachts at the 2017 Palm Beach Boat Show, March 23rd through 26th. The line-up includes a new 700 Motoryacht, and 860 Deluxbridge Skylounge Motoryacht, and an 820 Cockpit Motoryacht. The new 2017 700 Motoryacht will make her debut, as well as be christened at the show – a long standing tradition the Outer Reef Yachts ‘family’ upholds for new owners. The 700 Long Range Motoryacht is an award winning exploration motoryacht with classic style and exhilarating performance. Some of her distinguishing features include panoramic windows of the main salon providing inspiring views, a master with four owner and crew staterooms with ensuite heads, in addition to an on deck head with exterior access. 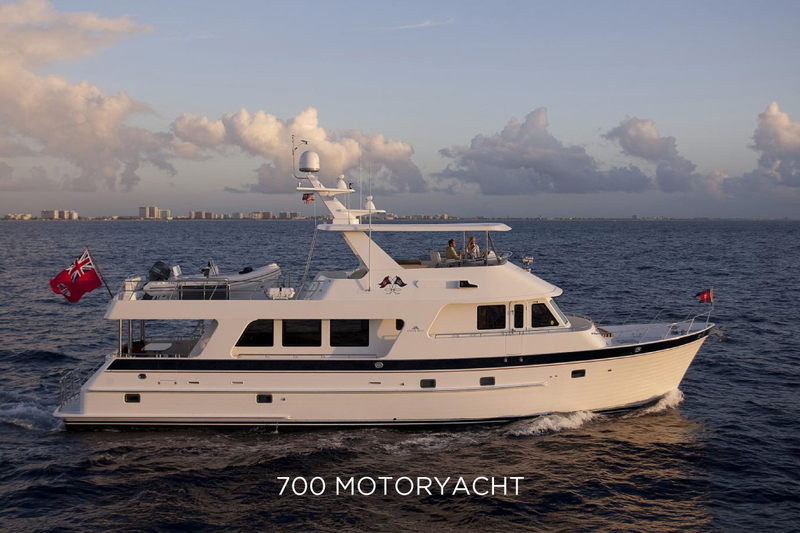 She also boasts the largest flybridge and boat deck areas on a 70’ yacht, and an exceptional range due to her optional C18, 136hp engines giving 17-18 knot cruise speeds. She is definitely a yacht to be celebrated by her new owners and all who have the opportunity to experience her! 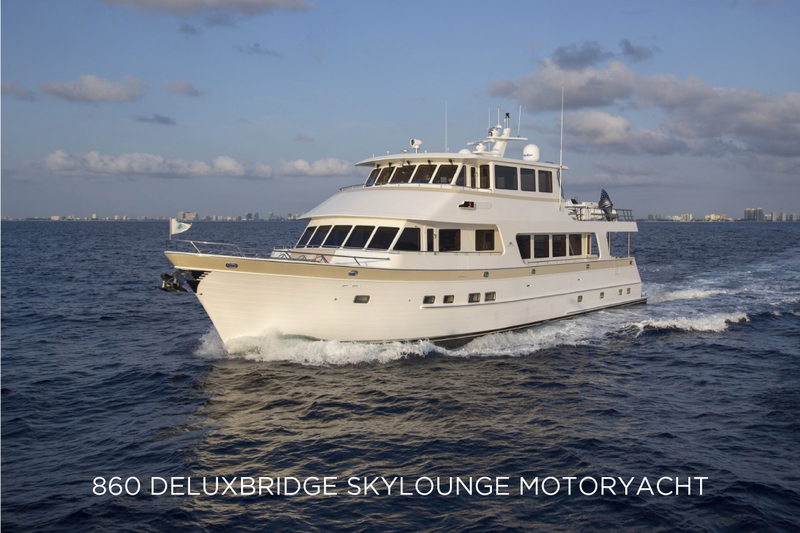 Outer Reef will also present the new 2017 860 Deluxbridge™ Skylounge Motoryacht at the show. High demand for this skylounge model has greatly increased due to the abundant advantages of a temperature controlled upper helm station, and protection from the elements during blue water and long distance cruising. Outer Reef Yachts’ 860 Deluxbridge™ layout features four spacious owner & guest cabins, two crew cabins aft with heads, lounge and galley. Because the upper helm station eliminates the need for main deck helm station, the galley space below is greatly increased, creating an expansive country kitchen for cooking, dining and entertainment. The spacious living accommodations echo the feel of yachts 100’ (30 Meter) and above, and the ample skylounge area provides additional, private and protected dining, entertainment, and office area – all welcomed space options that are valuable during extended journeys. Upgrades include a power system designed for the US or Europe, as well as the Caribbean, and beyond. Also, the state of the art temperature control system is setup to handle extremely hot and cold climates with 14 tons of air conditioning and a Webasto Diesel heating system throughout the boat, convenient for cold climates. For the most advanced security and safety, a Carlisle and Finch Nightfinder 200 spotlight has an integrated FLIR 320 x 240 pixel thermal camera, providing the best of night vision with a 15 million candlepower Xenon spot light capability. Lastly, the engines chosen for the boat provide a wide range of cruising speeds and ranges varying from 8.5 knots to 14.5 knots and up to and incredible 3000 mile range. This exquisite yacht is turnkey and ready for a discerning owner to start their cruising experience immediately. "BARBARA SUE II", a show-stopping 2015 820 Cockpit Motoryacht, is one of the most bespoke yachts Outer Reef has built and truly reflects the highest quality and sea keeping ability in her class. 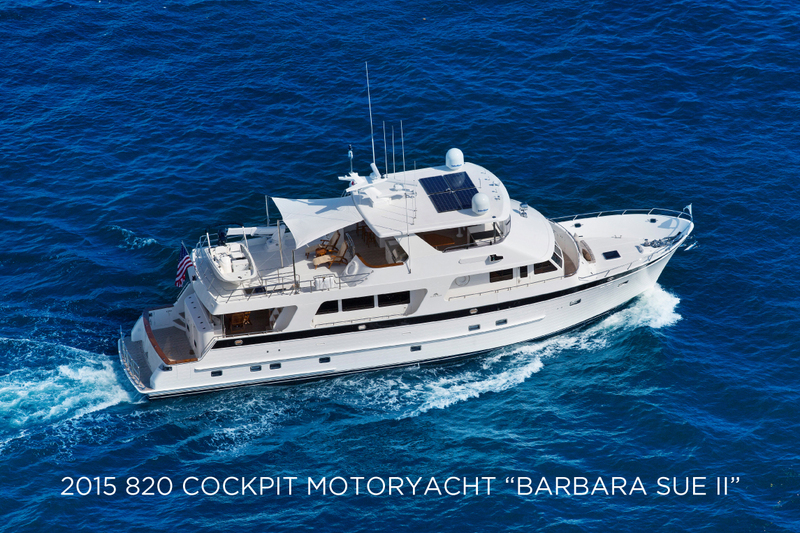 With over $590,000 in interior décor and factory upgrades, "BARBARA SUE II" is highly customized yachts. With $250,000 in navigation and Audio visual equipment, she is state of the art, with many systems still under manufacturer's warranty. Every door hinge and latch was upgraded, and a custom mix of teak and wenge wood throughout makes "BARBARA SUE II" an instant classic. We hope you will join us at the Palm Beach Show to experience these fine yachts, and to allow the Outer Reef Team to provide personalized tours and additonal information. Please register here and we look forward to seeing you at the show.